Mike Moore | The Journal Gazette Angola junior Dyer Ball has the ball knocked away from him by a Woodlan defender while driving to the basket in the third quarter Tuesday at Woodburn. Ball scored 10 in the Hornets' victory. WOODBURN – Angola coach Ed Bentley said his teams have a “mental toughness light” that flips on at some point in each season. That light may not be burning quite yet, but it flickered on Tuesday night as the visiting Hornets held on to beat Woodlan 48-41 and improve to 2-1. 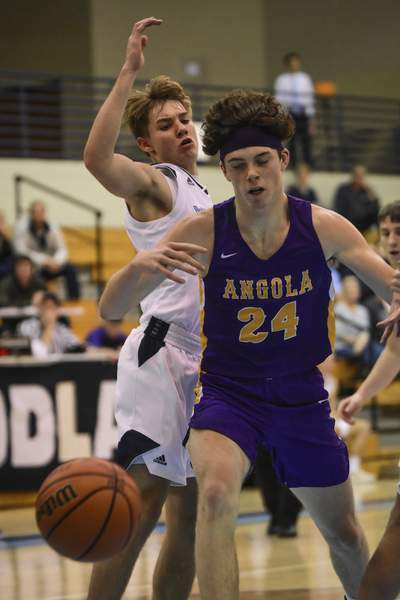 Angola had a modest lead for much of the game, but Woodlan (1-4, 0-1 ACAC) climbed back into the game late in the third quarter and finally tied the game at 39 with 3:18 remaining in the fourth quarter. Joel Knox scored to put the Hornets up by two and Angola made seven of eight free throws in the final minutes. Woodlan struggled to stop Angola's Luke Honer under the basket. He led the Hornets with 13 points, all in the first three quarters. Blake Pocock hit three of eight 3-pointers and finished with 12 points. Dyer Ball scored 10. While Bentley felt that his Hornets took some bad shots in the second half, the Warriors were even colder shooting from outside, missing all but two of their 11 shots from behind the arc. Joe Reidy, a 6-foot-5 freshman, led Woodlan with 15 points. Mitch Mendenhall, who tipped in a layup in the final seconds of the first half to go into the break down 23-18, scored 11 for the Warriors. The Hornets were coming off a 48-45 loss to Central Noble in their NECC opener. Bentley said several of his players are still settling in to basketball shape after making it to regionals with the football team, but he was happy to clinch the team's first road win.